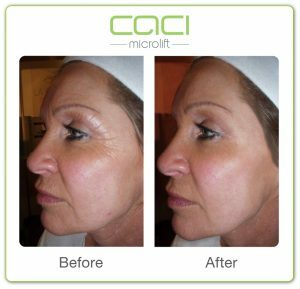 CACI treatment systems truly deliver visible and corrective results without the need for surgery or invasive procedures. The dramatic results achieved using our exclusive technologies has generated huge demand for CACI treatments. The original CACI (Computer Aided Cosmetology Instrument) was developed by Dr. Thomas Wing for treating Bell’s Palsy (a type of facial paralysis). 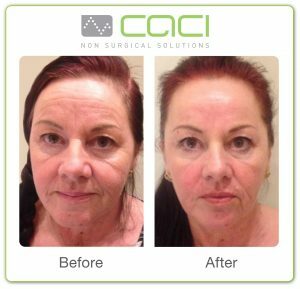 Today, CACI is a world renowned aesthetic treatment that is commonly referred to as “The Non-Surgical Facelift” and is a favourite beauty treatment of numerous celebrities and film stars. CACI Microcurrent gently helps tighten and tone sagging muscles whilst smoothing the appearance of ne lines and wrinkles. The dual-tipped probes increase the effect on the muscle and when combined with the T-bar attachment have dramatic rming and lifting results on the face. An impressive feature of CACI is the ability to simultaneously use pads and probes, which enable the face and neck areas to be treated at the same time. CACI Jowl Lift has been developed to specifically target muscle laxity around the jawline which can cause drooping jowls and loose skin. This treatment is specially designed to lift and firm the muscles and refine facial contours to give a firmer, more toned appearance. The CACI Eye Revive treatment uses serum called CACI microcurrent rollers together with a deeply nourishing Hydro Eye Mask to lift hooded eye lids, reduce puffiness and dark circles and soften the appearance of fine lines and wrinkles around the eyes. Facial treatments tailored specifically for you. The flexibility of the CACI system allows us to develop completely bespoke treatments, that target each client’s areas of concern. During your initial consultation we talk through the type of treatments available and then define the areas that you feel need treating. We then plan a course of therapy which will best achieve the desired results, over a period of time most suitable to you. If you would like to experience the stunning affects of this treatment, please contact reception to arrange a consultation. Please contact reception to find out more about these therapies or to book an appointment. Copyright 2018 The Core Zone.